BBQ Food Truck Dallas: What Makes A Good Brisket? What Makes a Good Brisket? Sometimes the best meals take the most time to prepare. This is especially true when it comes to making a brisket. Before we go on any further, think about the last time you had brisket. We’re willing to bet that it was soft and satisfying with unbelievable flavor. What most folks don’t realize, though, is that brisket is actually one of the least tender cuts of beef. So how do you go about choosing the right brisket for your occasion and what’s the best way to cook it? Keep reading to learn more. Craving Delicious BBQ? Contact Us Today! Let’s start with the basics. Brisket is a beef cut taken from a cow’s breast section beneath the first five ribs. This boneless cut requires long, slow cooking to break down the collagen in the connective muscle tissues to achieve ideal tenderness. This is where inexperienced brisket cookers can get confused. It’s up to you whether you’d like the flat cut, thin cut, center cut, or point cut. What makes all these cuts so different? Well, if you’re making corned beef, then it’s probably best to choose the flat, more attractive cut (it’s easier to slice, too). Are you hoping to make a nice stew that the entire family will enjoy? The point cut makes the most sense for this dish since it has more flavor due to the extra fat. Maybe you’re wondering, “What do pitmasters prefer?” The common answer tends to be the point cut as well since it shreds nicely. It doesn’t matter whether you want braised, brined, or smoked brisket. In any case, the meat requires plenty of time to cook. Keep in mind that a smoked, Texas-style brisket cooks at a low temperature for a good part of the day. Are you cooking a braised brisket? Then you should plan on cooking the meat for at least three hours to allow it to absorb the liquid from vegetables. Cowtown – Nothing beats a brisket sandwich at lunchtime. The Cowtown features our must-try Texas brisket on a brioche bun with one side. Texas Tacos – These aren’t your average tacos. We load you up with three chopped brisket or pulled pork tacos on a white corn tortilla served with Monterey cheese, pico, and queso fresco. Remember to have napkins handy for this one! Just the Plate – Just want the meat by itself? Not a problem. Take your pick from brisket, pulled pork, and sausage. Just the Plate also comes with two tempting sides. 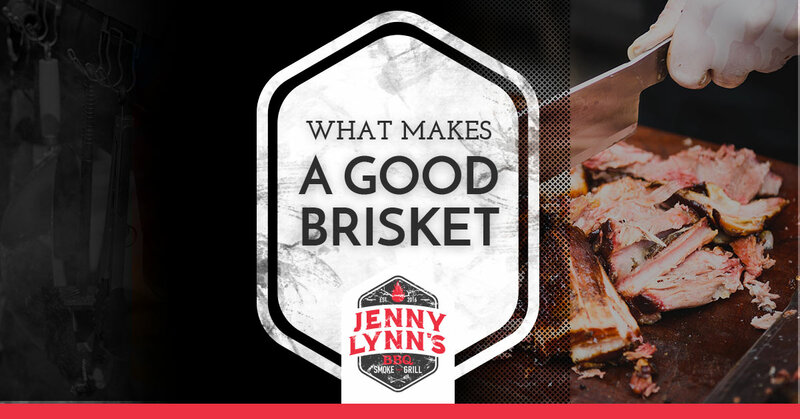 Whether you’re craving a brisket sandwich, pulled pork sandwich, or something else, Jenny Lynn’s has you covered. Even the pickiest eaters will surely find something they love on our BBQ menu! 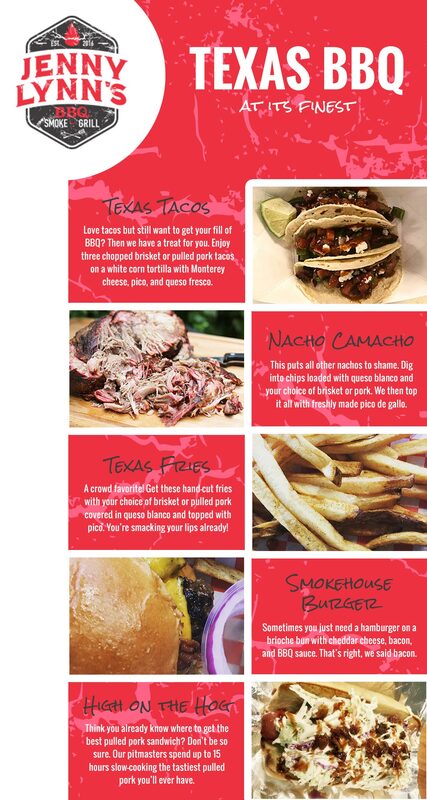 Stop by Jenny Lynn’s today for the best BBQ food truck experience in Dallas.